The last time Symphony Parnassus performed with violinist Alex Zhou, he was a fresh-faced 14-year-old just getting used to playing with an orchestra. Three years later, while he’s still young at 17, he is a much more seasoned performer, self-assured in his art and finding deeper expression when he plays. They are also available at the door. Alex is a two-time winner (2015 and 2018) of the Parnassus – San Francisco Conservatory of Music Concerto Competition. The first time, he performed the Mendelssohn Violin Concerto; this time, he’s playing a piece that is a far cry from the early romantic lyricism of that piece. He looks forward to introducing audiences to the lesser-known violin concerto from the 20th century film composer Erich Wolfgang Korngold. Alex lives with his parents James Zhou and June Hu in San Jose and attends The King’s Academy school in Sunnyvale. He started piano lessons at age 5 and began playing the violin a year later after seeing a home video of his older sister performing in her elementary school orchestra. Intrigued, he found her old violin and tried to play it, and soon began taking violin lessons, too. 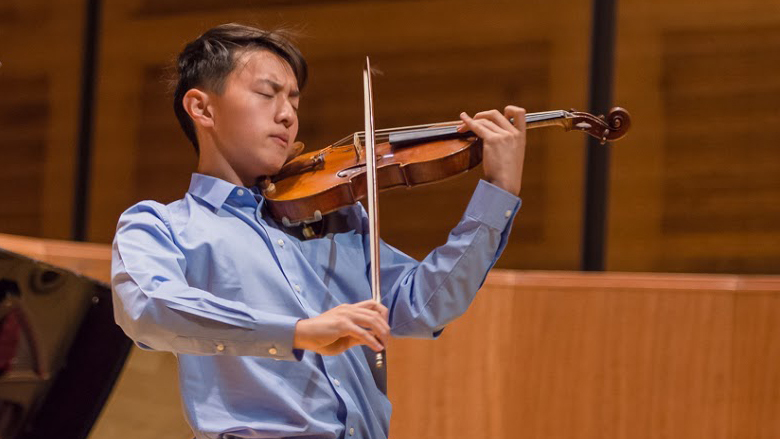 Now almost through with high school and set to graduate, he spent the earlier part of this year playing the Tchaikovsky Violin Concerto at college auditions and is still waiting to hear which conservatory he might attend.